In my 30 years of working with therapeutic diets, IDDSI is probably the most significant and far reaching change I have seen. At first glance it seems like a straight forward adjustment to texture modified foods and thickened liquids but in fact, it requires a coordinated, interdisciplinary effort. Because when well implemented, IDDSI will save time, money and most importantly provide safer care, it is well worth the effort. And since IDDSI has been adopted by the Academy of Nutrition and Dietetics as well as the American Speech-Language-Hearing Association it will certainly become embraced by most institutions. It can become overwhelming to contemplate such sweeping change, but I have found that having a strong foundational understanding of IDDSI by all stakeholders makes progress smoother and quicker. Therefore, I am sharing with you how I have translated IDDSI for our Roche Dietitians clients as we move forward with implementation. The International Dysphagia Diet Standardisation Initiative (IDDSI) began with a committee of food and swallowing professionals from around the world. Their goal was to develop global, standardized terminology and definitions to describe texture modified foods and thickened liquids for individuals with dysphagia of all ages, in all care settings, and all cultures. The IDDSI committee built a framework of diet and liquid levels for serving texture modified foods and thickened liquids after systematically reviewing dysphagia research and practice data. The IDDSI framework provides detailed definitions and descriptors for each level along with methods for testing that foods and liquids meet the standard definition of that level. 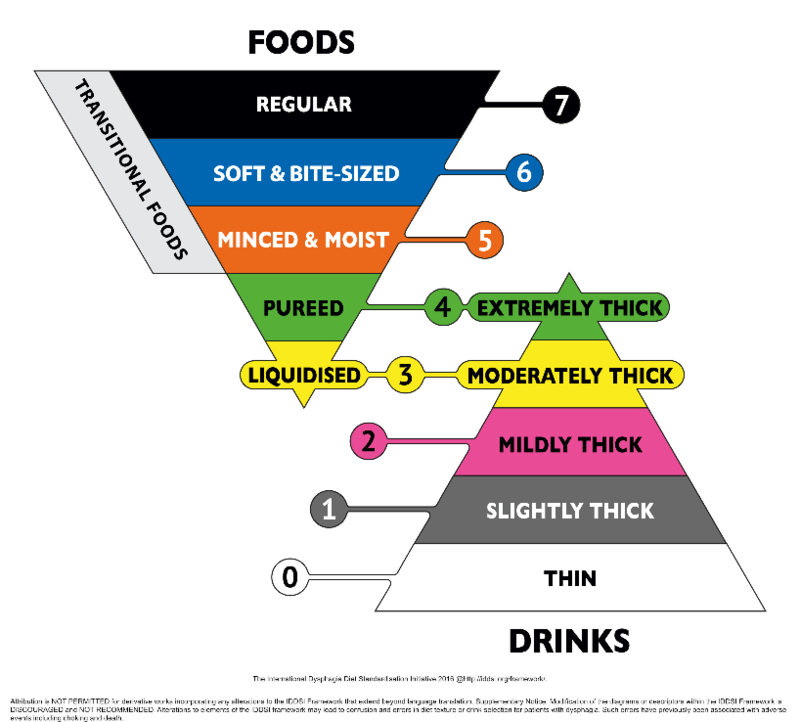 The IDDSI framework has 8 levels ranging from level 0 for thin liquids to level 7 for regular texture foods. Each level is distinctly identified with a color, number and a label. The combination of the 3 identifiers will help to limit errors in prescribing, identifying, preparing and assembling dysphagia diet orders. Levels 3 and 4 are connected between the foods and drinks because the behavior/characteristics of pureed foods is very similar to that of extremely thick liquids and liquidised foods to that of moderately thick liquids. IDDSI helps us think about texture modified food’s characteristics as they relate to chewing and swallowing. We are interested in particle size, moisture, stickiness and softness. We now have a language to identify texture modified foods and a standard way to define each unique level. What else is new is that we have a way to test food to verify it’s at the expected state before it’s eaten. And this testing can and should occur anywhere throughout the process of procurement, preparation and service. Below is a chart of the IDDSI diets that we built as an introduction to IDDSI. It helps our clients understand IDDSI in a snapshot. I hope it helps you as well. Let us know in the comments section below. Below is a chart that we created to use in Roche Dietitians training and educational programs to give an overview of IDDSI testing for foods. Testing foods is a new concept so taking a bird’s eye view is the first step in the process of incorporating testing into recipes, food service operations, meal service and training. This chart helps identify the testing methods as well as which diets they are applied to. I am including the newly created Regular, Easy to Chew (Level 7 Diet). Let us know if you find this chart helpful and if you have any additions or edits that you would make by leaving a comment below. See IDDSI webinar: Using the IDDSI Flow Test in Clinical Practice: How Thick is Thick and does Thickness Really Matter? You do not have to adopt all IDDSI levels. It depends on the needs of the population you serve. For example, in the older adult population, many folks have a need for soft foods but do not necessarily have swallowing problems. Here we would use the more liberal Regular, Easy to Chew (Level 7) diet over the Minced & Moist (Level 5) diet. Start with liquids as they are the easiest. The terminology will change (Thin (Level 0), Slightly Thick (Level 1), Mildly Thick (Level 2), Moderately Thick (Level 3)), so diet orders will need to change but the level of thickness is probably very close to what you are using now. Starting with liquids is a good way to test your process for education and training, diet order changes and testing processes. Practice using the tests to see where how well the texture modified foods you currently serve meet the IDDSI testing standards. This works particularly well with pureed foods. You can focus on getting your puree foods to IDDSI standard before moving on to other diet levels. Spread the word in your institution and recruit a champion to support you in your IDDSI journey. Don’t reinvent the wheel. Hire a consultant who has recipes, menus, testing forms, training materials and other resources to help you along the way. Keep learning. Interested in more information about IDDSI? Click here to get your top 17 IDDSI tips! Get in on the conversation. Let’s build a community to support each other on our IDDSI journey. Share your thoughts in the comment section below. I will respond to all comments and questions. Or click the Let’s Talk button and we can talk directly. Using the IDDSI Flow Test in Clinical Practice: How Thick is Thick and does Thickness Really Matter?